Develop opportunities and partnerships among libraries, library systems, state government, private industry, the nonprofit sector and others to expand statewide access to e-resources for all New Yorkers. Achieve a model of consortial licensing of commercial e-resources with shared cost or tiered pricing among New York State Library, SUNY, CUNY, library systems, state agencies and other partners such as NYLA and NYSHEI. Expand the core collection of commercial e-resources available statewide to include additional library materials for academic research, small business, K-12 education, workforce development and lifelong learning. Partner with vendors and others to explore technology solutions such as geo-location to streamline and enhance remote access to commercial e-resources for all New Yorkers. Partner with vendors and others to provide training for library staff and patrons in accessing and using e-resources. Strengthen partnerships among the State Library, library systems and others to improve the delivery of library materials statewide. Develop opportunities for more libraries to offer virtual meetings, distance education and other technology-based applications for the public. Partner with library systems and others to ensure that all New Yorkers have access to a local public library. By 2017, 500 libraries and library systems in New York State will use preferential pricing negotiated under terms of a new model for statewide access. At least 5,000 library staff and end-users will participate in e-resources training between 2012 and 2017. Sixty million searches will be conducted in 2017 in databases delivered to New Yorkers through statewide licenses. By 2017 the State Library website will demonstrate a 10% increase in use from 2012. By 2014, at least 50 percent of library and library system staff who have attended a training session on products of the statewide database program will indicate in focus groups, surveys, or interviews that they feel confident in promoting and facilitating use of these resources. By 2017, 80 percent of New Yorkers replying to a survey will report benefiting from use of an e-resource through a library. By 2017, 20% of public library outlets will have virtual meetings, distance education and other technology-based applications available to the public. An average of 350 libraries and library systems per year will receive E-rate discounts between 2012 and 2017. By 2017, an additional 100,000 formerly unserved New Yorkers will benefit from having a local library in their community. By 2016, 30 percent of libraries receiving E-rate discounts will report via survey that E-rate discounts enable them to offer services valued by their end users. GOAL 2: The New York State Library, library systems, and libraries will deliver new and improved programs that anticipate and meet New Yorkers' constantly changing needs for library services. Strengthen partnerships among the State Library, library systems and others to educate library staff, library trustees and others about innovative models of public library governance, program delivery and support. Support, encourage and expand innovative library programs, improved services and effective evaluation processes in libraries and library systems by providing a range of advisory services to help library staff use performance (outputs) and results (outcomes) in measuring progress toward excellence and community impact. 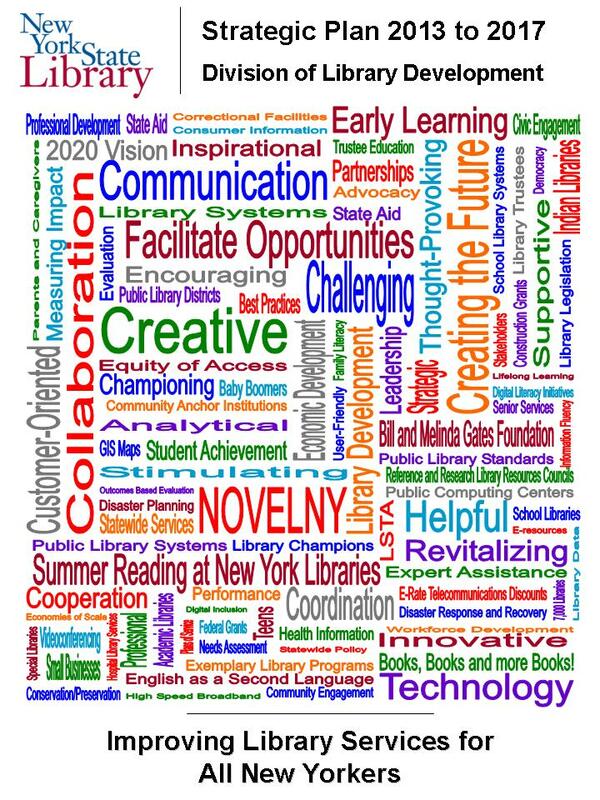 Enhance national, state and regional communications about the innovative and exemplary library programs and best practices of New York’s libraries and library systems. Strengthen partnerships among the State Library, library systems, libraries, IMLS and others to provide user-friendly, timely, and accurate data via the Internet for the ongoing evaluation and continuous improvement of library services and programs. Strengthen partnerships among the State Library, the State Education Department’s Office of Higher Education, reference and research library resources systems and academic and special libraries (both statewide and nationally), and others to improve, enhance and sustain programs and services of New York’s academic and special libraries. Strengthen partnerships among the State Library, the State Education Department’s Office of Adult Career and Continuing Education Services, public library systems and public libraries and others to improve, enhance and sustain workforce development, lifelong learning and literacy programs and services of New York’s public libraries. Fifteen public library districts will be established between 2012 and 2017. By 2017, the number of libraries with disaster recovery plans will increase from 47% (based on 2009 survey results) to 60%. By 2017, the number of participants contributing to the dark archive for audio digitization projects maintained by the State Library will increase by 5 percent. By 2015, 60 percent of library and library system staff and library trustees will indicate through surveys that they are better able to anticipate and meet changing customer needs and better able to measure their progress toward achieving service excellence as a result of training provided by the State Library and its partners. Partner with national, state, regional and local organizations to ensure that library staff, trustees and patrons have ongoing access to high-quality digital literacy training programs. Incorporate the use of library e-resources into summer reading program materials, activities and promotion. Strengthen partnerships that enable public libraries to assist young families and child care providers in fostering early literacy skills for all children in New York State. Connect local libraries with statewide networks of childcare providers, non-profit organizations, public broadcasters and others to enhance early childhood services, including parent education (see Goal 4). Partner with national, state, regional and local organizations to increase family and caregiver participation in library-based early literacy programs that foster a literacy-rich home environment. Strengthen partnerships among the New York State Council for the Humanities, the State Library, library systems, libraries and others to enable more public libraries to offer early literacy/family reading program in their communities. By 2017, eighty percent of the P-12 schools in New York State will have collaborated with one or more public libraries in promoting student participation in Summer Reading at New York Libraries. Summer Reading at New York Libraries will report an annual participation level of 1.8 million children and teens by 2017. By 2017, the number of public libraries offering early literacy programs will increase by 20 percent. By 2017, the number of public libraries involved in local collaborations to enhance early childhood health and school readiness will increase by 20 percent. By 2017 the number of public libraries offering adult literacy and/or English as a Second Language (ESL) programs will increase by 25 percent. A minimum of 1,200 library staff will be trained to deliver digital literacy services to library users. By 2017, 75 percent of public libraries will have staff skilled in provision of early literacy services. School Leaders will indicate that students have benefited through participation in Summer Reading at New York Libraries as reported by a sampling of school leaders through qualitative surveys conducted annually at selected schools. By 2017, 75% of public library and library system staff will indicate through surveys that they are better equipped to provide strong summer reading programs for their communities and that they use materials provided by the New York State Library for this purpose. 30 percent of childcare providers participating in the QUALITYstarsNY childcare rating and improvement system will work with public libraries to support and enhance their early learning programs. People using public libraries will benefit from expert staff trained in delivering digital literacy services as reported by a sample of users through qualitative surveys conducted annually from 2014 to 2016 at selected public libraries. Increase the visibility of the statewide programs and services of the State Library available to New Yorkers. Regularly share information concerning the impact of LSTA federal funds with the library community and the general public. Seek public and private partners in the implementation of the activities identified within this five year plan. Use new communications technologies to provide leadership, technical assistance, advisory services and professional development more effectively to libraries and library systems. Revise State Education Department policies, regulations and program guidelines as needed to keep pace with change and to implement this five year plan. Continuously improve online planning, budgetary, and reporting tools for use by the State Library and by local libraries and systems. Build capacity to enhance early childhood outcomes by partnering with statewide early childhood networks including (but not limited to) the NYS Early Childhood Advisory Council; the Early Care and Learning Council and its network of childcare resource and referral agencies; United Way of NYS and its local United Ways; public television stations; and early childhood teacher preparation programs. The State Library will display information about LSTA-supported activities at 25 meetings or public events by 2017. The number of hits pertaining to LSTA-supported activities on the New York State Library website will increase 10 percent each year over 2012 levels. The State Library will facilitate two community partnerships to support early childhood education. GOAL 5: Library Development will have a supportive work environment that enables all staff to provide high-quality, cost-effective services to customers in a timely manner. Continue to improve the physical work environment for Library Development staff. Provide frequent opportunities for strategic and operating plan updates with staff and customers. Improve the range and depth of expert advisory services available to libraries and systems through the use of new technologies coupled with onsite technical assistance visits. Continue to improve the timely and accurate processing of formula aid and grants through enhanced business processes, sound internal controls, clear documentation and instructions, and supportive staff and customer communications. Encourage all staff members to achieve high competence levels with office technology and software to improve the accuracy and efficiency of work. Provide thorough orientations and job training to new staff including training in teamwork, customer relations, telephone courtesy, effective email, correspondence, and using web-based products and information. Every Library Development staff member will have an up-to-date performance plan that reflects Library Development’s strategic and operating plans. Library Development is adequately staffed and has sufficient funding to carry out strategic and operating plans. Customers and staff are knowledgeable about progress on strategic and operating plans. By 2017, 80% of Library Development customers will indicate improvement in the range and depth of the advisory services received. 80% of Library Development staff indicates on an annual satisfaction survey that they are satisfied with the physical work environment and that they have improved their office technology and supervision skills. 100% of Library Development staff will have current annual performance plans and evaluations.